Alexandra Munroe with her exhibition catalogues, 2015. 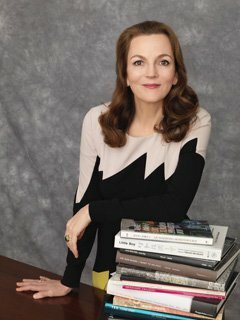 Alexandra Munroe is an art historian and curator who has engaged in empirical research and advanced the study of Japanese art from the postwar to the contemporary period, and has planned and organized several museum exhibitions. In 1994, Dr. Munroe began work as guest curator at the Yokohama Museum of Art on Japanese Art After 1945: Scream Against the Sky, an epoch-making exhibition that established a new interpretive history of postwar Japanese art, comprehensively covering significant art movements from the postwar to contemporary periods in a broad cultural, political, and international context. The exhibition, which toured the United States from 1994 to 1995 to great acclaim, was based on Dr. Munroe’s profound knowledge and understanding of Japanese culture and presented Japanese avant-garde art to the world as an autonomous body of work on its own terms, moving beyond the Euro-American perspective. The show and its accompanying scholarly catalogue contributed to heightening the international appreciation of Japan’s Gutai, Neo-Dada, and Mono-ha groups as well as the works of a younger generation of Japanese contemporary artists. Since 1989, she has curated or co-organized numerous exhibitions that have highlighted individual aspects of Japanese art of the postwar and contemporary periods, including Yayoi Kusama: A Retrospective (1989), Daido Moriyama: Stray Dog (1999), YES YOKO ONO (2000), Little Boy: The Arts of Japan’s Exploding Subculture, by Takashi Murakami, (2005), and Gutai: Splendid Playground (2013). She has also published scholarly catalogues of the exhibitions, which include her own essays backed by solid academic research. These publications serve to introduce the contents of exhibitions to the English-speaking world, thereby helping to deepen understanding and appreciation of Japanese art in an expanded, global history of modern and contemporary art. At the Guggenheim, her exhibition, The Third Mind: American Artists Contemplate Asia, 1860-1989 (2009), explored the impact of art, literary texts, and philosophical concepts of Japan and Asia on the development of American artistic practices from the late 19th century through the 1980s, and was awarded the National Endowment for the Humanities inaugural Chairman’s Special Award. Dr. Munroe has contributed to the promotion of international mutual understanding through her many years of museum experience organizing ground-breaking exhibitions. We award her the Japan Foundation Award in recognition of her work and look forward to her future endeavors. Dr. Munroe donated the prize money to PoNJA-GenKon to create an “Online Bibliography of Post-1945 Japanese Art” in partnership with the Centre for Transnational Cultural Analysis (CTCA) at Carleton University, Ottawa. PoNJA-GenKon was established in March 2003 by art historians Reiko Tomii and Miwako Tezuka as an online listserv group. The acronym stands for “Post-1945 (Nineteen forty-five) Japanese Art Discussion Group/Gendai Bijutsu Kondankai.” The goal of PoNJA-GenKon is to bring together specialists and professionals in the English-speaking world with interest in post-1945 Japanese art, and to offer a forum for interaction and debate on issues addressing postwar Japanese art and Japanese modernity. Over the past 15 years, it organized eight conferences, symposia, and panels in collaboration with leading academic institutions and museums in the U.S.
Read related article in Wochi Kochi Magazine. 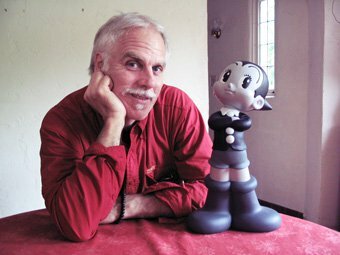 Frederik L. Schodt is a writer and translator and best known as a pioneer of manga and translation for four decades.As a college student in Japan in 1970, he started to develop an enthusiasm for Japanese graphic narratives, or “story-manga,” and in 1977~8 with some friends he translated part of Tezuka Osamu’s Phoenix. While this effort did not lead to an actual publication, it was the beginning of a 12-year relationship with the inexhaustible manga author. Eventually, in 1983, Tezuka contributed a foreword to Schodt’s first monograph Manga! Manga! The World of Japanese Comics. At that time “story-manga” was already flourishing in Japan, but readers abroad could not yet access these graphic narratives without being in command of the Japanese language. Against this backdrop, Schodt provided not only a rich seam of information in Manga! Manga! The World of Japanese Comics, but also almost one hundred pages of translated manga. This attitude—to not just teach people about an unknown culture, but share the experience of this culture with them—has been characteristic of Schodt’s whole career well into the 21st century and its internet-based participatory culture. Within this new environment, Schodt continues to build bridges between those who do and do not read manga, and further between those who do and do not appreciate classic manga narratives like Tezuka’s. While highly acknowledged worldwide for his promotion of manga, Schodt has also drawn attention with his books to other forms of marginalized art. These include a book on a Japanese acrobatic troupe formed by an American acrobat in 1867 (Professor Risley and the Imperial Japanese Troupe, published in 2012). He also translated a manga work created in San Francisco in 1931 (by Henry Yoshitaka Kiyama, published in English in 1998 as The Four Immigrants Manga), that depicts the lives of four young Japanese men in the United States between 1904 and 1924. It recently attracted attention again and has been made into a popular musical. It is precisely Schodt’s commitment to intercultural as multilateral exchange that deserves an accolade. We accordingly present him with the Japan Foundation Award and look forward to his future successes. Andrej Bekeš has been a driving force for Japanese-language education and Japanese studies in Slovenia for many years as a professor at the University of Ljubljana. He has also engaged actively with other Japanese studies research institutions in Europe and has played a pivotal role in creating Europe-wide research networks for researchers in Japanese studies, particularly in the field of Japanese-language education and Japanese linguistics. In 2014 he served as chair of the local organizing committee for the 14th International Conference of the European Association for Japanese Studies (EAJS), his endeavors serving to further cement the position of Japanese-language education and Japanese linguistics in Europe. Professor Bekeš has a long association with Japan, dating back to 1972 when he joined the Special Course for International Students of Osaka University of Foreign Studies (current Center for Japanese Language and Culture of Osaka University). Although he continued his studies at Graduate School of Science of Osaka University, he came to be fascinated by the Japanese language, ultimately leading him to specialize in Japanese studies. 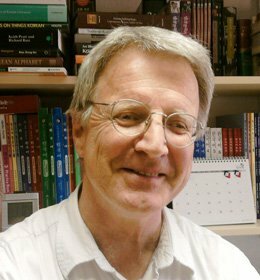 After gaining his PhD from the University of Tsukuba in 1986 for a doctoral thesis titled “Tekusuto to Shintakusu” [Text and Syntax] he returned to Slovenia, but by 1990 he was back in Japan again, engaged in Japanese-language education and Japanese language research at the University of Tsukuba. In 1995 he returned to Slovenia once again and was appointed as the first head of the newly established Department of Asian and African Studies in the Faculty of Arts at the University of Ljubljana, thereafter working to advance Japanese studies and cultivate human resources in Slovenia. In 2010 he was appointed professor at Graduate School of Humanities and Social Sciences and International Student Center of the University of Tsukuba, where he focused his efforts on nurturing Japanese studies scholars and educating international students. In 2013 he returned to the University of Ljubljana as professor of Japanese studies, where he continues to be a preeminent figure in Japanese linguistics and Japanese-language education in Slovenia. He also continues to engage in lecture programs at universities in Japan. His achievements in the field of Japanese linguistics are wide-ranging, covering various areas including the study of grammar, comparative linguistic research, and text and discourse studies. He has also embarked on a new initiative, working with Japanese-language educators in Japan on the joint development of Nihongo Gakushusha no Tame no Nihon Kenkyu Shirizu [Japanese studies series for Japanese learners], a reading comprehension learning material for the purpose of developing expertise in Japanese studies from study of Japanese-language. Professor Bekeš has thus contributed to the promotion of international mutual understanding through long years of dedication to Japanese-language education and Japanese studies in Slovenia. We award him the Japan Foundation Award in recognition of his work as a researcher and educator who has built bridges between Japan and Slovenia and Japan and Europe, and look forward to his future endeavors. Professor Bekeš donated the prize money to the Slovene Science Foundation（SLOVENSKA ZNANSTVENA FUNDACIJA: SZF）to create the new foundation named “JAPONSKA MED NAMI”(Japan among us). The purpose of this foundation is supporting exchanges between Slovenian and Japanese researchers and promoting Japanese studies more in Slovenia. The Slovene Science Foundation was founded in 1994 by some of the most prominent Slovene institutions, whose activities span virtually all areas of scientific endeavor, including the Slovene Academy of Sciences and Arts (SAZU), the University of Ljubljana, and the University of Maribor.